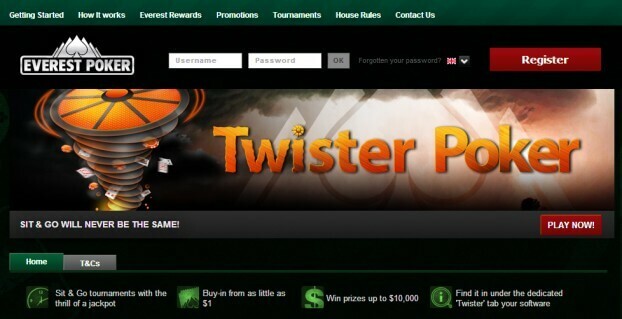 Everest Poker which is part of the popular iPoker Network has announced Twister Poker which is an adaptation to regular Sit & Go tournaments. With a traditional Sit & Go’s players know the prize pool before paying their buy-in fee, in Twister Poker all prize pools will be randomly determined right before the first card is dealt. 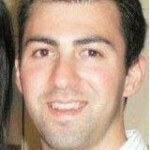 All of the sit & go tournaments will be three handed with a winner take all format. The blind schedule are all based on the turbo sit and go format to ensure the games move extremely fast. The buy-ins range from $1 up to $10 and the prize pools will range from 2 to all the way up to 1,000 times the buy-in. That means if a player plays in a $10 Twister Poker sit & go and the wheel stops on 1,000 the prize pool will be $10,000. 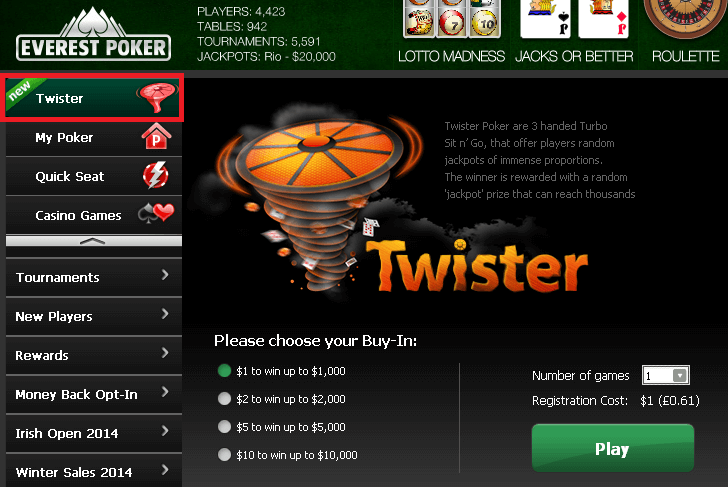 Players will need to load up the Everest Poker Software and then simply click on Twister which if found the left. Take a look at the image below to get a better idea of how the lobby looks.